Art can be complicated to explain, due to the diverse range of activities that is involved, including painting, photography, music, dance, theater, and more. The communities of Ludington, Pentwater and Manistee are alive with an array of cultural events that take place throughout the year. Combined with the beauty of lake views and richly forested land, this area of West Michigan has emerged as a venue for those who truly love all kinds of art. A group of local residents had a vision a few years back to create a "hub" in Ludington where all the arts could come together...and the Ludington Area Center for the Arts was born. Housed in the former historic United Methodist Church building, it is now the home for theater presentations, concerts, writer's forums, speakers, and gallery exhibitions. Arts and crafts studios are located on the second floor and in the lower level. Nothing brings people together more than music, and there is certainly no shortage of concerts and performances in the Ludington area. Summer music fills the air with events such as Scottville's Summer Concert Series, Pentwater Civic Band concerts, and live music at Friday Night Live in Ludington. Not a week goes by that you can't find a musical performance somewhere in West Michigan. Our very own West Shore Community College presents its Performing Arts Series which includes entertaining plays, jazz and choir concerts and unique artists gifted in piano, guitar, saxophone, and numerous other instruments. 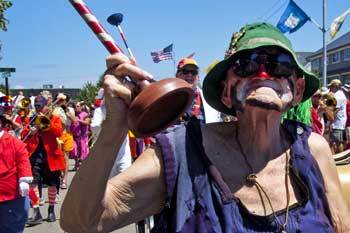 The hilariously funny and talented Scottville Clown Band has been entertaining crowds for well over 100 years. Members of the band come from all walks of life and all across the country. They are definitely the highlight of summer parades throughout the state. A movie is a nice escape from life, but a good live performance is hard to beat. Here in West Michigan we have three venues for outstanding plays. The Historic Ramsdell Theater is where the famous actor James Earl Jones got his start and features top-notch performances by the Manistee Civic Players. West Shore Community College and the Ludington Area Center for the Arts also showcase local talent in their theater productions. Outdoor theatre performances of Shakespeare and other classical works come alive each summer during the Stratford on the Avenue Theatre Festival in downtown Ludington's Rotary Park. While shopping or dining in downtown Ludington, look around and be amazed at the murals that adorn the outside walls of many area businesses. Painted by various artists, these murals tell the story of the people and events that made Ludington what it is today. Just two blocks from downtown is the beautiful Waterfront Park. Nestled between two marinas, you'll find a playground, tables, paved walkways and nine bronzed sculptures. As you walk the park, stop and admire these works of art that depict Ludington's maritime, farming and lumbering history. Other sculptures have been added to what is now referred to as the Sculpture Trail including "Flights of Learning" in front of the Mason County District Library, and "Rearing Horse Memory Pole" at the Mason County Fairgrounds. Amateur and professional photographers love the beauty of the Ludington area and its spectacular scenery to create digital memories. 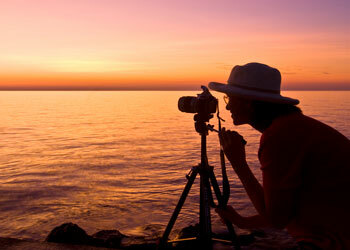 Photo Workshops are held throughout the year to help people learn how to take the best possible picture. Our lighthouses, beaches, sunsets, and Ludington State Park provide the perfect backdrop for memorable vacation photos. 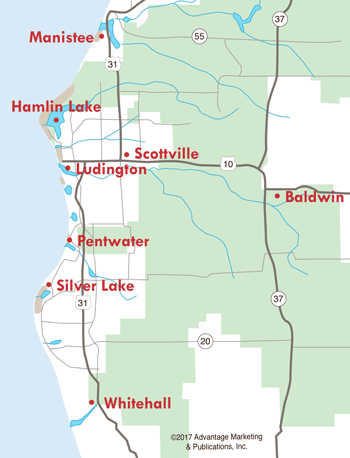 Small towns are known for arts and crafts fairs, and Ludington has two separate events during the summer. 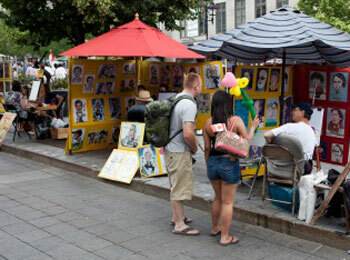 The first, the West Shore Art Fair, is a juried fine arts fair held in early July. The second event is the Gold Coast Artisan Fair held in mid-August. Pentwater has its Fine Arts Fair in mid-July on the Village Green, and other local communities such as Manistee also hold Art Fairs. If you're a person that loves browsing through antiques stores, then Ludington is for you! This area is rich in antiques, and there are numerous shops throughout the four-county area. 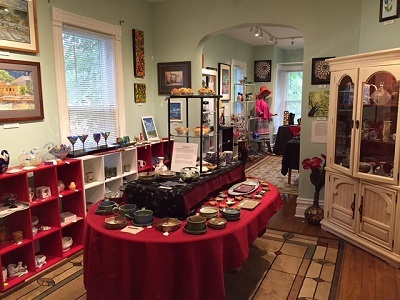 The Shoreline Antiques Association is a great place to start to find your new treasure. Come enjoy the visual, musical, and performing arts in this beautiful place we call Ludington.